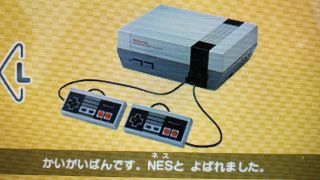 There are few debates within the gaming community as longstanding and intense as whether you pronounce Nintendo's first stateside home console, the Nintendo Entertainment System, as "N-E-S" or "Ness" (or, in some circles, "Nez"). While clamor over this bit of minutiae had died down in recent years, the argument has gained new traction thanks to the recently-released WarioWare Gold for 3DS. As Twitter user Kyle McLain points out, a screenshot from the Japanese version of WarioWare Gold places the characters for "ne" and "su" above "NES," which would mean a reader would pronounce it "nesu". So that solves the debate, right? The system is officially pronounced "Ness". But not so fast! Remember, the NES wasn't called the NES in Japan - there, it was the Famicom. And here in the United States, advertisements frequently referred to the console as the "N-E-S," with each letter pronounced separately - a fact that several replies to McLain's tweet point out with commercials from Super Metroid and Kirby's Adventure. So we have Nintendo of Japan saying one thing, and Nintendo advertisements saying another. What gives? Interestingly, it may just come down to what's easier to type. The way an English speaker would pronounce "Ness" is, as mentioned before, just two characters in Japanese. But the way an English speaker would pronounce "N-E-S" is made up of six Japanese characters. It's just a quirk of language and writing that an English speaker can read "NES" and think of two different pronunciations - in Japanese, the difference is more clear. Put another way, imagine if every time you were talking about the NES, you had to type out or say "Nintendo Entertainment System". That's pretty much the decision Japanese writers and speakers have to make, and they're opting for the simpler choice. Personally, I've always pronounced the NES with each letter, not as a single word. But when it comes to the SNES, I do pronounce it as one word. But, I realize I am a monster, and you shouldn't follow my example. Still, I'm curious: how do you pronounce "NES"? No matter how you pronounce it, the NES had one heck of a lineup. And whether you play them on an emulator, a NES Classic, or a still-functioning OG NES, you're gonna want to experience the best NES games of all time.